Located along the Beamsville Bench, the area where most of Canada’s premier grapes are grown. 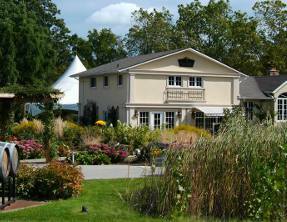 The Stoney Ridge Estate Winery produces some of the finest wines in the region since it was established in 1998. Some of the unique features at the Estate Winery are the state-of-the-art crush pad to accommodate any amount of grapes, and a specialized hopper to separate free-run juice from the grapes to produce ultra premium wines. Stoney Ridge also owns two-20,000 Litre, thrity-10,000 Litre, and nine-5,000 Litre Tanks on property to separate the juice and the stems in the winemaking process. 250 to 300 premium French and American Oak Barrels are located in the cool and secluded barrel room of the estate winery to produce the Pinot Noir, Chardonnay, Cabernet Franc, Merlot, and Cabernet Sauvignon Wines. This vineyard is located directly behind the Estate Winery. Formerly a plum and apple orchard the land was replanted in 1999 with grape vines spaced eight feet apart and trellised with the Pendelbogen Method. The main varietal planted here is Pinot Noir, which encompasses 3 acres of the vineyard. The picturesque property stretches over 40 acres of land bordered by ravines. The vineyard has excellent natural drainage and great soil decomposition to help the grapes produce fantastic flavor and character. The land consists of 7,500 Pinot Noir Vines, 11,250 Cabernet Franc Vines, 5,375 Cabernet Sauvignon Vines, and 10,125 Merlot Vines. These public tours at the winery are available two times a day at 11:00 am and again at 2:30 pm on weekends. The Tour is $5.00 and lasts 30 minutes. Taste three bench wines and enjoy a 45 minute tour for $10.00. Taste three reserve wines and enjoy a 1 hour tour for $15.00. This tour is available by appointment only. Taste three reserve wines paired with a cheese & bread tray and enjoy a 1 hour tour for $25.00. Taste one icewine and a late harvest wine paired with cheese/chocolate and enjoy a 1 hour tour for $25.00.